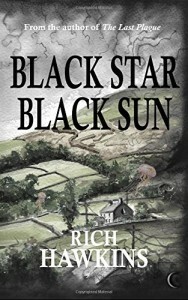 Reading Rich Hawkins’ novella, Black Star, Black Sun, is a bit like waking up and finding the world has already been consumed by fire, and the final embers are burning the ashen remains. It is a fearless journey into an abyss of despair. Why would anyone want to read that? Because it’s hauntingly beautiful. We begin with Ben Ottway returning to his hometown, a small village in England, after the mysterious disappearance of his wife, but this is no thriller with plot twists you can see coming a mile away or that are surprising because they’re utter nonsense. Ben’s wife is gone, and the point is his world has ended, yet he fights it and remains hopeful. The imagery and detail in Rich’s prose provide a weight to the storytelling that is akin to grief. It is masterful how a string of Rich’s words can convey such a sense of foreboding beneath their literal meaning. This is Black Star, Black Sun’s greatest strength. It is not a complex story, but Rich’s prose is solid and poetic, often dispensing with conventional structure to pack a punch. At its bones, this is Lovecraftian/cosmic horror at its finest. It has all of the elements that make that kind of story great, but it doesn’t neglect the driving force of character. That is, while many of Black Star, Black Sun’s contemporaries focus on the inevitability of destructive gods we can’t possibly understand, Black Star, Black Sun is both humanizing and relatable, and that’s specifically what makes it extraordinary. When oblivion comes and all is lost, we do not feel alone. There is just nothing in this novella that isn’t well done. Its only limitation is in what it is: a dark, horrific journey into death and understanding that your end is coming and there is nothing you can do to stop it. That isn’t exactly prime-time entertainment, but for those of us who appreciate this kind of thing, Black Star, Black Sun is an inspiring gem. I also enjoyed The Last Plague by Rich, and you can read my review here. Tagged Apocalyptic, Books, Horror, Lovecraft, Reading, Reviews, Rich Hawkins.